"I really liked the studio space and thoroughly enjoyed meeting Iris' students. Can't wait to return for another engagement as soon as the opportunity presents itself." 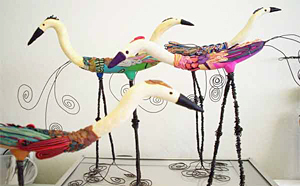 Thank you Laura Balombini for teaching us how to build these fabulous birds out of polymer clay. We hope you return to Sandkühler Studio!